Male: white head and neck, speckled black; fleshy knob (comb) on top of beak; black back has purple green gloss; greyish lower back; white lower-neck collar and underbody; short black bars extend on sides of upper breast and flanks. Female: duller, smaller; lacks comb. Small parties, either on water or in trees over water; nests in tree cavities; feeds on surface and in cultivation; can also dive. jheels and marshes with surrounding tree cover. shoots and seeds of water plants, grain, aquatic insects, worms, frogs. almost entire India; mostly resident but moves considerably with onset of monsoons; uncommon in extreme S and NW India. 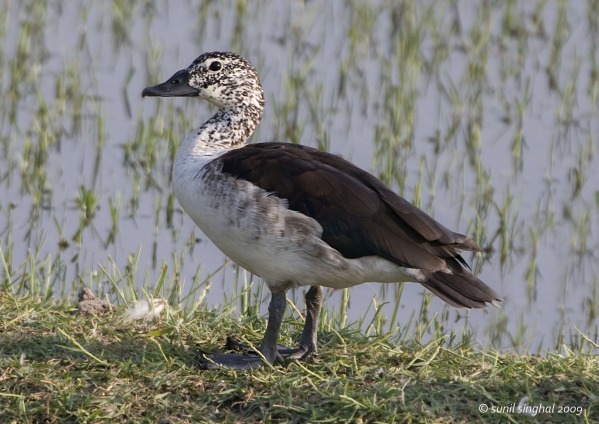 Also widely known as the Comb Duck or Nakta the Knob-billed Duck, is one of the most interesting wildfowl in our area and little is known about its true status. It appears to be a scarce and local resident, often in small wetlands or wet agricultural land. However, its numbers vary considerably at every site however. It is often in single gender flocks, the smaller females being easily separable from the males. There seems to be an increase in flock sizes (although flocks rarely exceed 40) in the pre-monsoonal summer months and then a marked increase in September and October, perhaps reflecting post-breeding dispersal. Knob-billed Ducks usually nest in a tree hollow or a cliff hole and can often be seen perched on bare tree branches. It is possible that in our area they seek out large trees dotted about agricultural land. This would partly explain their erratic appearance at wetland sites. Though the larger wetlands are favoured, birds do turn up at quite small sites including village ponds. These ducks feed in well-vegetated shallow water on aquatic vegetation and also graze lush grass. They are shy birds and are one of the first wildfowl to take off if approached too closely. They fly high in straggling groups and often for considerable distances. There is some concern that the population is declining in India but the reasons are not understood. loud, goose-like honk when breeding.